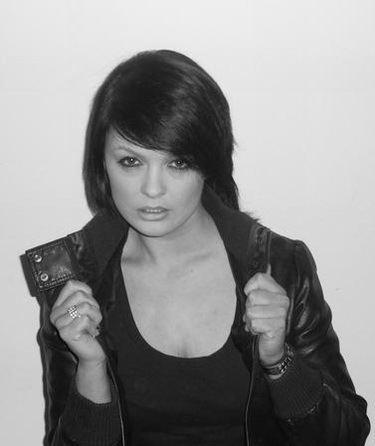 Sinead Mulvey, 21 сomes from Dublin (Clondalkin). She started out singing professionally at the age of thirteen when she was picked over two hundred girls for the lead role of Cinderella in the anthem productions pantmime. 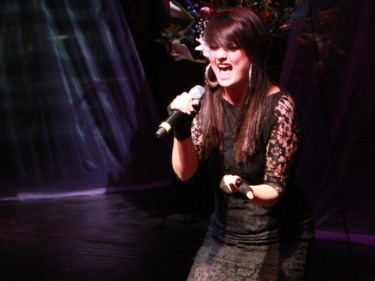 For several years Sinead has worked consistently on her stage performance and has played lead roles in the Liberty Hall Panto several times. She appeared in the hit show on RTE “You’re a Star” where she sang her way to the live finals in the Helix belting out a good range of tunes from the white stripes to Britney Spears. 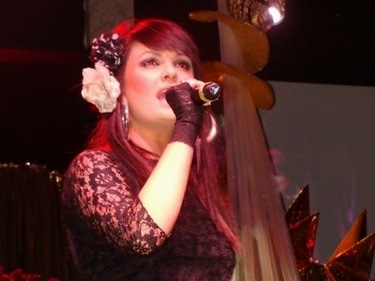 Sinead recorded the original demo “Love” which was used that year in the eurovison. 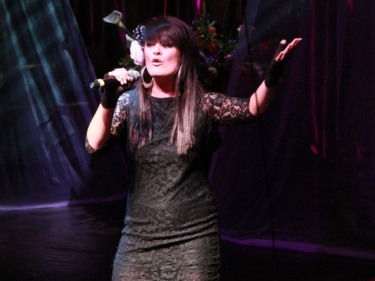 Sinead came very close to representing Ireland in the Eurovison that year and that desire has stayed with her. Currently a flight attendant with Aer Lingus it would appear that Sinead’s music career is really about to take off! After being approached by several writers to enter Eurosong, Sinead decided to team up with long standing writing collaborators Niall Mooney (Galway) and Jonas Gladnikoff (Sweden). Jonas and Niall have clocked up a staggering 7 National Finals around Europe in the last 5 years. Niall and Brendan McCarthy (Waterford) came third in You’re a Star in 2004 with their song "Summer rain". 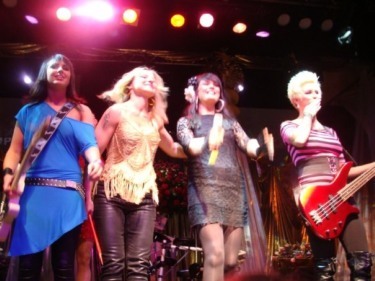 Jonas and Niall enlisted Christina Schilling (Denmark) and Daniele Moretti (Italy) to complete the writing team, with Brendan McCarthy producing the song with Black Daisy and two backing vocalists (Angela Holland and Camilla Gottschalk) joining Sinead on stage. Jonas says, "Sinead’s song is loud, it’s fast, it’s really catchy and it could really rock Russia!" It all started about 4 years ago when singer L.A. left her hometown of Limerick and came to Dublin in search of a dream of forming a rock band. Finding Steff, an amazing guitarist, was the best thing to happen, and from there Black Daisy was formed. Constantly gigging, rehearsing and writing new songs, it took a long time before the band really found their sound, and through the ups and downs band members came and went as well as various name changes to the band. L.A. and Steff stuck together though, determined to keep going, they searched for the ultimate other half of the group that would complete Black Daisy..which they found in drummer Asta Mileriene from Lithuania (living with her husband Darius Mileris (Nojus) in Dublin), and solid rhythm guitarist Nicki Billings from Blessington, Co Wicklow. 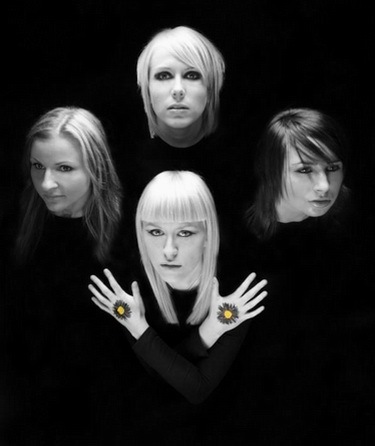 Black Daisy is now complete and the four members compliment each other with their wide range of influences ranging from Metallica and Iron Maiden, to No Doubt, Pink, K.T. Tunstall and cheesy 80's music. Band got their first success by also taking part in RTE You're A Star. Band has released debut E.P. "Disturbing New Fashion". Watch official video for "Et cetera" here. National final performance is available here. You can listen to the song at myspace of the performers. myspace.com/enschilling Шинед Малви - родом из Дублина. Она начала профессионально петь в возрасте 13 лет, когда она победила на кастинге из более 200 кандидаток на роль Золушки. В течении нескольких лет она совершенствовала свои сценические выступления и играла главные роли в Liberty Hall Panto. В 2005 году она принимает участие в шоу телеканала RTE "You're A Star", где, исполняя песни из различного репертуара - от White Stripes до Бритни Спирс - она попала в финал. Шинед даже записала оригинальную демо-версию песни "Love", которая выступила в этом году на Евровидении. Несмотря на то, что Шинед в год проекта не попала на конкурс - это желание навсегда осталось с ней. Хотя в настоящее время она является стюардессой Aer Lingus - она готова взлететь и в своей музыкальной карьере! После того, как с ней связывался ряд авторов и предлагал ей принять участие в Евровидении, Шинед наконец решилась начать сотрудничество с давними партнерами Найаллом Муни (Галуэй) и Йонасом Гладникоффом (Швеция). Йонас и Найалл уже принимали участие в 7 национальных отборах по всей Европе за последние 5 лет. Найалл и Брендан МакКарти (Уотерфорд) заняли третье место в You're A Star 2004 с песней "Summer Rain". Йонас и Найалл добавили в свою команду Кристину Шиллинг (Дания) и Даниель Моретти (Италия), Брендан МакКарти спродюсировал песню, группа Black Daisy и две бэк-вокалистки (Анджела Холланд и Камилла Готтшалк) присоединилась к Шинед на сцене. Йонас говорит: "Песня Шинед очень громкая, быстрая, запоминающаяся и должна порвать Россию!". История группы начинается 4 года назал, когда солистка L.A. решила перехать из родного Лимерика в Дублин и начать воплощать свою мечту о создании рок-группы. Найдя Стефф, потрясающую гитаристу, они сформировали группу Black Daisy. Постоянно выступая, репетируя и записывая новые песни, прошло немало времени, пока группа смогла найти собственное звучание. Другие члены группы и ее название постоянно менялись. L.A. и Стефф продолжали искать постоянную вторую половину группы и нашли, наконец, ее в лице барабанщицы Асты Милярене из Литвы (со своим супругом Дарюсом Милерисом (Nojus) проживающая в Ирландии) и ритм-гитаристки Ники Биллингс из Блессингтона, Виклоу. Сейчас Black Daisy полностью укомплектованы и четыре участницы группы дополняют друг друга их широким музыкальным интересом, простирающимся от Metallica и Iron Maiden до No Doubt, Pink, K.T. Tunstall и музыки 80х. Первый успех к группе пришел также после участия в проекте телеканала RTE You're A Star. Группа выпустила дебютную E.P. "Disturbing New Fashion"
Официальный клип на песню "Et Cetera" вы можете увидеть здесь. Выступление на национальном отборе доступно здесь. Прослушать песню можно на myspace исполнителей. 29/04 With just days to go until she takes off for Moscow, Eurovision hopeful Sinead Mulvey has received a welcome vote of confidence. The Herald has reveal the Clondalkin native is set for big things after signing a recording contract with Sony BMG Music. The record label completed negotiations with the 21-year-old air hostess last week and is planning to release her first single, Et Cetera, on Friday. "We're really excited about having Sony on board," Sinead said. "They have been fantastic. The single is out on May 1 and I can't wait." However, the talented lass is determined her main focus right now is ensuring that she's ready to do Ireland proud when she and her backing band Black Daisy take to the stage in the Russian capital. Sinead explained how she and vocal coach Maureen Ward have been busy following a strict plan in recent weeks so that her voice is at its strongest when she gets to Russia. In addition to her intense rehearsal schedule, she has also kept on her job as a full-time air hostess with Aer Lingus, and has had her hands full trying to balance the two. She feels we're in with a strong shot this year, particularly after it was announced that organisers had decided to give juries and viewers a 50pc stake in the outcome of the contest in a bid to reduce political block-voting. Всего за несколько дней до отъезда в Москву, конкурсантка из Ирландии Шинеад Малви сообщила о том, что ей удалось заключить контракт с компанией Sony BMG. Переговоры завершились на прошлой неделе, а сингл на песню "Et Cetera" должен появиться в продаже в пятницу. "Мы очень рады тому, что Sony проявило к нам интерес", заявила Шинеад. "Это просто фантастика. Сингл выходит 1го мая и я никак не могу этого дождаться". Однако, певица в первую очередь концентрируется на успешном выступлении в столице России. Шинеад рассказала ирландской The Herald о том, как она вместе с педагогом по вокалу Маурин Ворд разработали четкий план подготовки, который должен сохранить силу ее голоса перед выступлением в России. В дополнении к подготовке к Евровидению Шинеад продолжила свою постоянную работу и в качестве стюардессы компании Aer Lingus, пытаясь сбалансировать оба занятия. Представительница Ирландии считает, что в этом году у них есть определенные шансы, поскольку были изменены правила голосования и 50% исхода теперь будут определяться профессиональным жюри. 12/04 Sinead Mulvey & Black Daisy, the Irish act in this year's competition, will do virtually no promotion in Europe for their track 'Et Cetera' aside from one date in Amsterdam later this month. It's a far cry from the promotional campaigns RTE staged for previous Irish Eurovision entries. Station chiefs sent singer Brian Kennedy to Bosnia, Croatia, Slovenia, Bulgaria, Serbia and Montenegro, to promote Ireland's 2006 entry 'Every Song Is A Cry For Love'. The targeting of these former Eastern bloc countries, who have been critical to recent Eurovision wins, is said to have ensured Ireland qualified from the Eurovision semi-finals and finished in the final ten songs of the main contest that year in Athens, Greece. The station insider said to The Tribune: "Programme Cuts. Wages Cuts. It's well known RTE is strapped for cash at the moment. But the worst catastrophe that could hit the station would be if Ireland did win the Eurovision Song Contest and RTE had to find millions to stage it in Dublin next year. That's the kind of bad dream from which RTE executives wake up screaming in the middle of the night." In what's being seen as another money saving move, Sinead Mulvey and Black Daisy will perform at the Moscow Eurovision semi-finals minus the two backing singers who helped them win The Late Late Show's Euro song Special on 20 February. However, an RTE spokeswoman this weekend claimed the station did want to win Eurovision this year and the decision not to have Mulvey do a promotional tour was because there was no proof this would lead to votes in the contest. The station spokeswoman also confirmed RTE's delegation to Eurovision this year would be smaller to reduce expenditure. Шинед Малви и группа Black Daisy, представители Ирландии в конкурсе этого года, фактически не совершают никакого промоушена в Европе для своей песни "Et Cetera", помимо одного небольшого выступления на фанатской вечеринке в Амстердаме. Это весьма далеко от того промоушена, который телеканал RTE организовывал своим представителям в прошлые годы. Руководство канала смогло помочь Брайану Кеннеди совершить тур в Боснию, Хорватию, Словению, Болгарию, Сербию и Черногорию перед Евровидением 2006. Нацеленность на т.н. страны "восточного блока" помогла Ирландии выйти в финал конкурса и войти в десятку лучших стран. Представитель телекомпании заявил газете Tribune: "Сокращение эфиров. Сокращение зарплат. Телекомпания RTE сейчас находится в финансовом кризисе. Но самым худшим сценарием может стать победа на Евровидении, когда нам придется искать миллионы, чтобы проводить его в Дублине. Это такой кошмарный сон, от которого руководство RTE просыпается ночью в поту". В еще одной попытке съэкономить средства, было принято решение, что Шинед и Black Daisy выступят на Евровидении в Москве без двух бэк-вокалисток, которые помогли им одержать победу на национальном отборе, прошедшем 20го февраля. Однако, пресс-атташе телекомпании обосновала отказ отправит Малви в промо-тур, поскольку нет подтверждения тому, что он приводит к каким-то результатам на конкурсе. Она сообщила также о том, что состав делегации канала на Евровидении будет урезан в целях сокращения расходов. 13/02 Irish RTE has announced the list of 6 finalists of the national preselection. A song "I Wish I Could Pretend" written by Latvian 2003 ESC representative Lauris Reiniks, now withdrawn from Latvian preselection, is believed to be favourite for the juries in the first voting round. Jury panel involved: Eurovision winner Linda Martin, Mark Crossingham from Universal Ireland, choreographer Julian Benson, Eurovision Commentator Larry Gogan, and Diarmuid Furlong from OGAE Ireland. The winner will be decided by combination of regional juries and televoting. National final, The Late Late Show: Eurosong Special will take place on 20th of February, 22.35 CET. Ирландская телекомпания РТЕ объявила список 6 финалистов национального отбора. Песня Лауриса Рейникса, представителя Латвии на Евровидении 2003 "I Wish I Could Pretend", снятая вчера с латвийского отбора, по некоторой информации стала фаворитом в предварительном голосовании жюри. В состав отборочного жюри вошли: победительница Евровидения Linda Martin, Mark Crossingham из Universal Ireland, хореограф Julian Benson, комментатор конкурса Larry Gogan и Diarmuid Furlong из ОГАЕ Ирландии. Победитель будет определен совместным решением региональных жюри и телеголосования. Национальный финал, The Late Late Show: Eurosong Special состоится в ночь с 20го на 21е февраля в 00.35 Москвы. National broadcaster of Ireland has confirmed the date of the national final, 20th of February, and announced that preselection jury will be chaired by Eurovision 1992 winner Linda Martin. Winner of the national final will be selected by mix of televoting and regional juries vote. Телекомпания Ирландии подтвердила дату национального финала, 20 февраля, и объявила, что председателем жюри отбора станет Линда Мартин, победительница Евровидения 1992. Победитель отбора будет выбран смесью телеголосования и регионального голосования. 15/01 Famous Irish music manager Louis Walsh plans to collaborate with music mogul James Hyland to create a new pop band for the Eurovision 2009, reports Evening Herald. "Ireland's Eurovision entry has basically gone to pot over the last few years, they have all been a total embarrassment. Over in the UK, Andrew Lloyd Webber has come on board but we don't seem to be taking it seriously. I've been speaking with a lot of people and I reckon a modern Bucks Fizz would work so I'm looking for two guys and two girls who are aged between 16 to 25 years of age, and who are natural-born performers", said James. "I've got some really good tracks from people who have written for the likes of Rihanna and Westlife, so finding the right song won't be a problem. We do a lot of gigs and we know the younger market inside and out and know what appeals to people," he continued. "I've known Louis Walsh for years so I asked for his advice, given that he managed two of our previous Eurovision winners and he's on exactly the same wavelength as us. He'll probably come on board at some stage as well." He's now hoping that his chosen band will then be selected by RTE as one of the finalists on the Late Late Show special later this year. "We want people who can sing and dance. We're looking for a High School Musical-style group. It's all about having fun with it," he added. "I know everyone slags off the Eurovision, but it's still one of the most-watched shows of the year. It's time to stop repeating the mistakes of the past by sending over people like Donna & Joe and do it properly, bring back a bit of national pride." Allegedly, last year Eurosong finalist Donal Skehan will be involved in this project. Update 18/01. Though castings for James Hyland's band go on today in Dublin, Louis Walsh has completely denied his involvement, stating: "It's nonsense - completely untrue. I think Ireland will have a good entry this year but I'm not involved with it. I'm too busy with my own groups like Westlife and Boyzone. Having said that, I reckon we have a better chance this year because of the new voting system. After Dustin last year, things can only get better". Знаменитый ирландский музыкальный продюсер Луис Уолш вместе с менеджером Джеймсом Хайландом планирует подготовить новую поп-группу для участия в Евровидении 2009. "Все недавние годы мне было стыдно за ирландские песни на Евровидении, мы скатились до невозможных низов. Смотрите, в Великобритании за дело взялся сам Ллойд Уэббер, а мы до сих пор не воспринимаем это серьезно. Я посоветовался со множеством людей и мы пришли к выводу, что должен сработать проект, а-ля современные Bucks Fizz. Я ищу двух юношей и двух девушек в возрасте от 16 до 25 лет с врожденным талантом", рассказал Джеймс. "У нас уже есть несколько отличных треков от авторов, которые работали с Рианной или Westlife, поэтому найти песню - для нас не проблема. Мы работаем со многими организаторами концертов и мы знаем рынок молодежной музыки изнутри, что нравится людям. Я знаком с Луисом Уолшем уже много лет и я попросил его совета, учитывая то, что он был менеджером двух последних победителей Евровидения из Ирландии, и оказалось, что мы с ним сходимся во мнениях. Думаю, он присоединится к нашей работе. Джеймс надеется, что его группа будет выбрана каналом RTE в качестве одного из финалистов национального отбора. "Мы хотим людей, которые умеют петь и танцевать. Мы хотим создать группу в стиле High School Musical. Я знаю, что все критикуют Евровидение - но в тоже время, это одно из самых популярных шоу в году. Время перестать повторять ошибки прошлых лет и отправлять певцов типа Донны и Джо, и начать работать по-настоящему, вернув стране частичку национальной гордости". Говорят, что в этот проект будет вовлечен и прошлогодний финалист Eurosong Donal Skehan. Обновление 18/01: Хотя кастинги группы Хайланда начнутся сегодня в Дублине, Луис Уолш полностью отверг то, что он будет занят с ней: "Это абсолютно не соответствует действительности. Я думаю, что у Ирландии в этом году будет хорошая заявка, но я не буду вовлечен в ее подготовку. Я слишком занят со своими проектами, как Westlife и Boyzone. Я, правда, считаю, что в этом году наши шансы повысились из-за введения новой системы голосования. Вообще, после прошлогоднего Дастина - все может быть только лучше"
1) Подходит ли песня к Евровидению? Ранее, национальная телекомпания вступила в переговоры с трехкратным победителем Евровидения певцом Джонни Логаном, чтобы он представил страну на конкурсе Евровидение 2009, однако, похоже эти переговоры завершились безрезультатно.